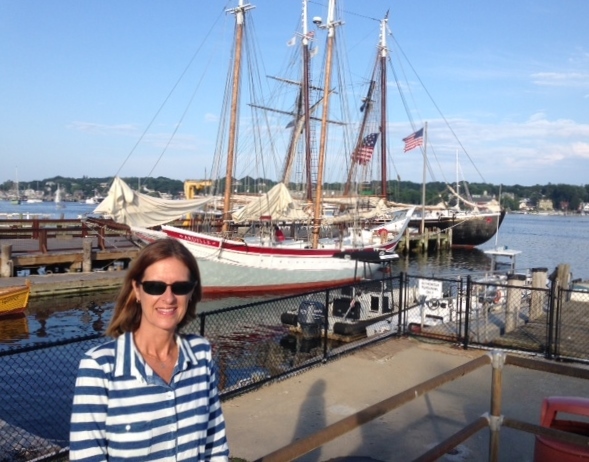 Cape Ann is made up of Manchester-by-the-Sea, Gloucester, Rockport and Essex. 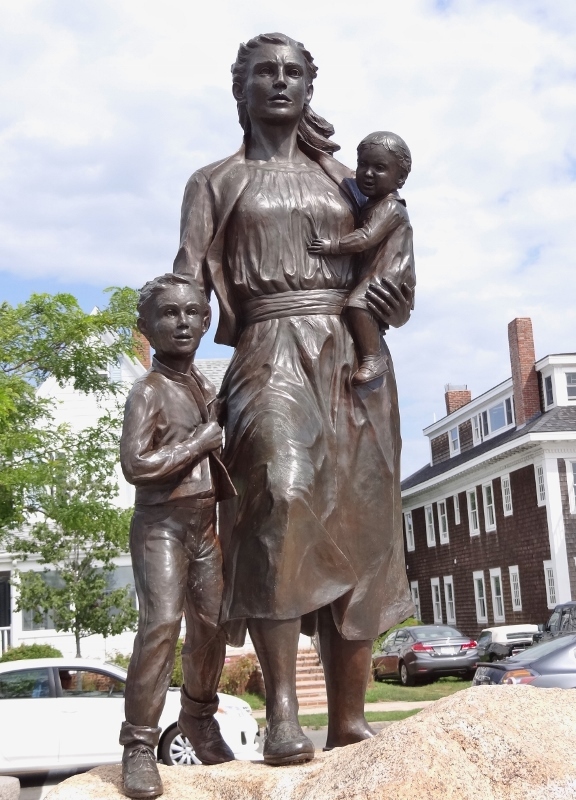 Essex is famous for its antique shops and Woodman’s that claims to be the birthplace of fried clams; Rockport is a darling artists’ haven with oodles of cute shops, and the busy commercial fishing port of Gloucester still boasts an active artist colony along with accessible cultural sights, varied dining options and easy meandering. 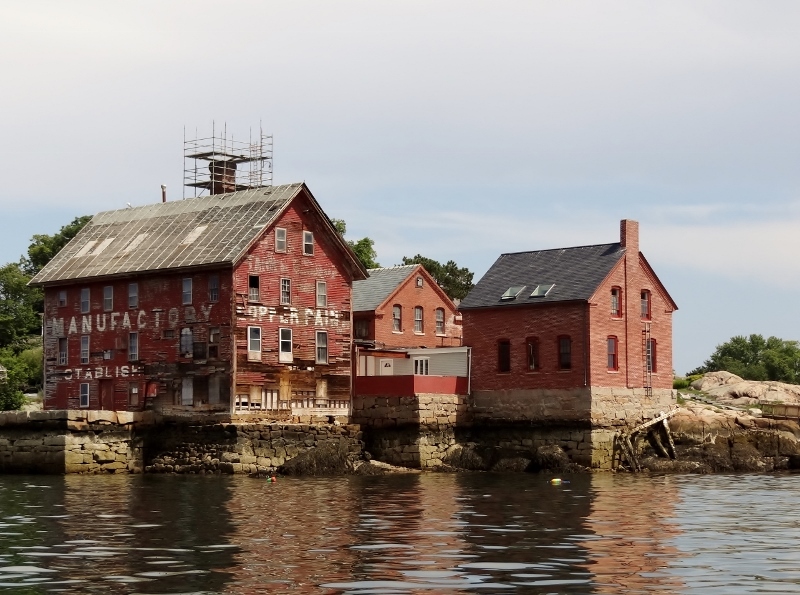 Gloucester may well be the last of old New England, below Maine. 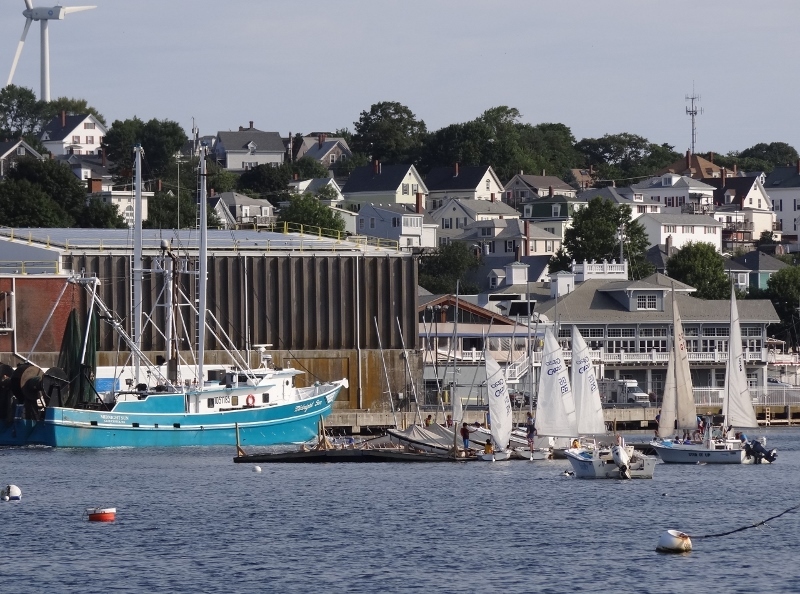 Gloucester is the oldest and foremost (perhaps second only to New Bedford, MA) fishing port on the East Coast and the harbor contains a mix of old and new as the fishing trawlers share their port with pleasure yachts and sail boats. NOAA used the word “tranquil” in a recent weather synopsis and boy they sure nailed it; days of settled weather make me almost forget what crappy weather is like. The main harbor is quite large and our destination was the inner harbor where we had mooring T2 waiting. 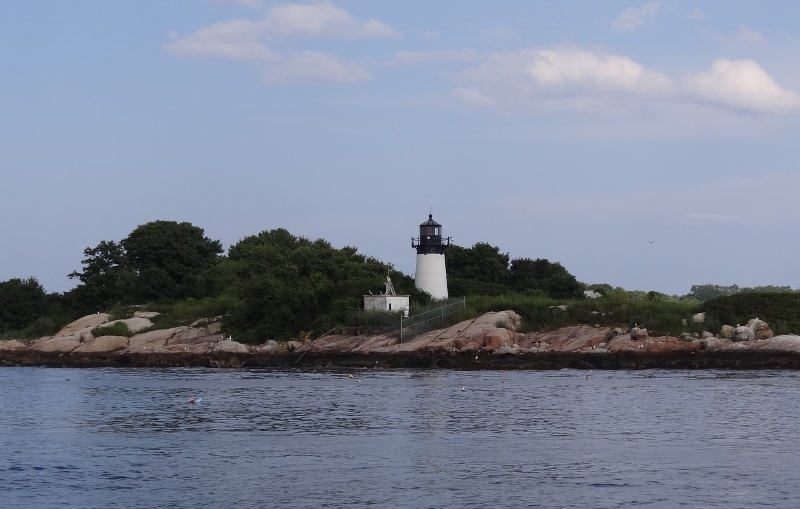 We passed Ten Pound Island where Winslow Homer sought solitude and a place where he could paint views of the harbor and sailing ships. Sebastian Junger’s The Perfect Storm was set in Gloucester and we couldn’t help think of that as we watched the fishing vessels, large and small, come and go. 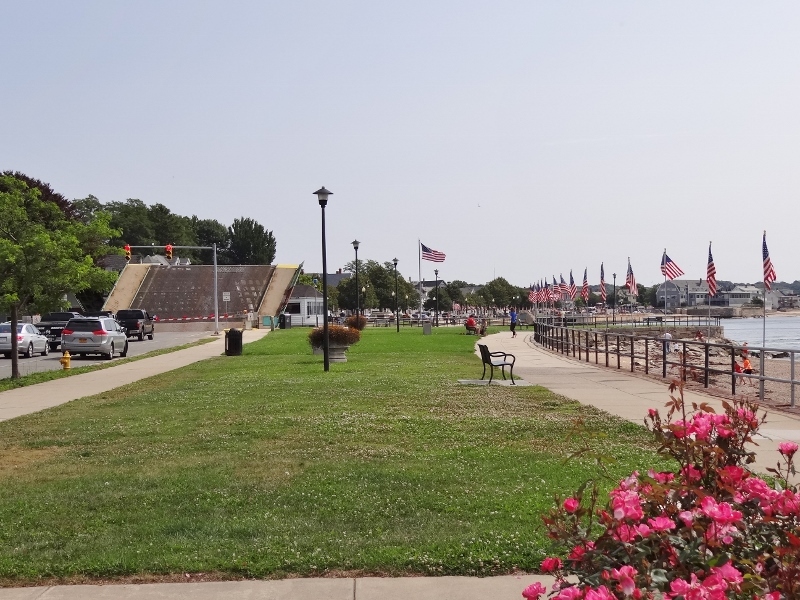 The waters can turn ugly in a heartbeat, but for now everyone was enjoying pleasant weather- not hot and just enough light breeze. The Harbormaster runs the anchorage and small mooring area that contains 5 transient moorings. We had T2 and almost got kissy-faced with the yacht on T1 when the wind shifted; we moved first and she didn’t. The owner suggested we toss out a stern anchor; ah no, not a good idea. For the remainder of our stay we had no problems. 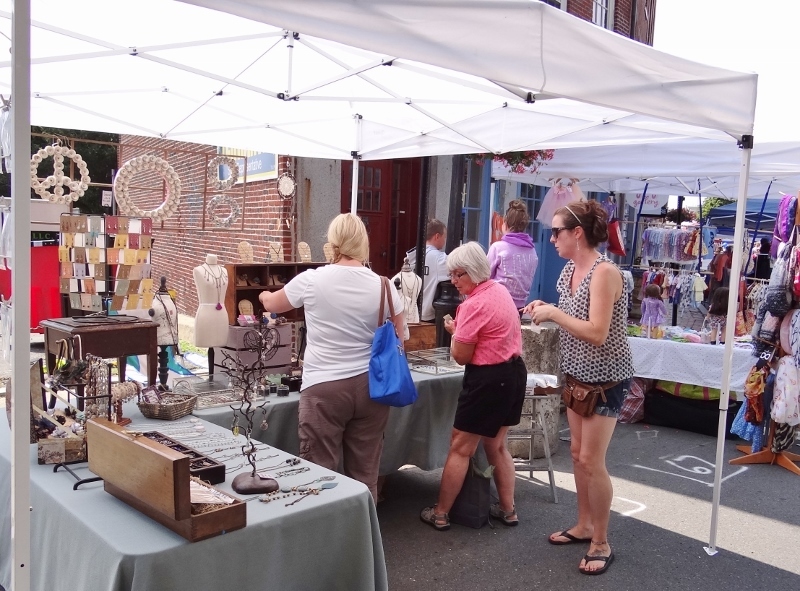 We continue to enjoy good timing with town events and fireworks; Wednesday kicked off the Waterfront Festival which included sidewalk and street vendors on Main Street (blocked off), music, more music and town-wide events. 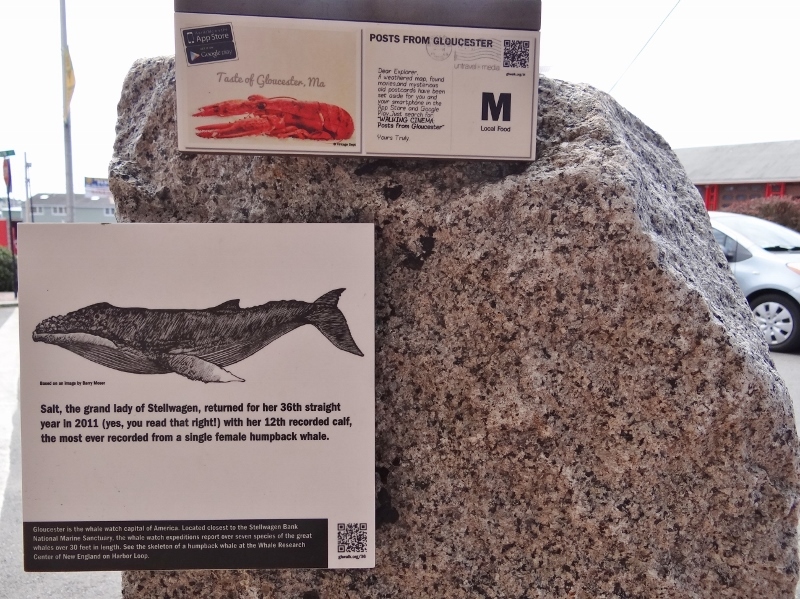 We didn’t have good luck at the Cape Ann Historical Museum which was opening (late) on Aug 19 after being closed for renovations. 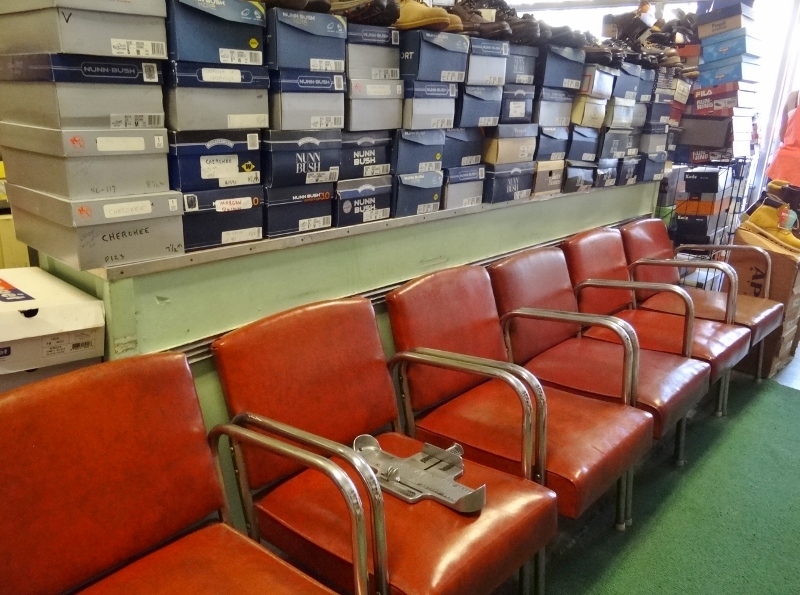 I wandered into this throw-back shoe store. Haven’t seen this look since the local Hamden Stride-Rite store of my very young childhood. The foot sizing thing was tempting to try. 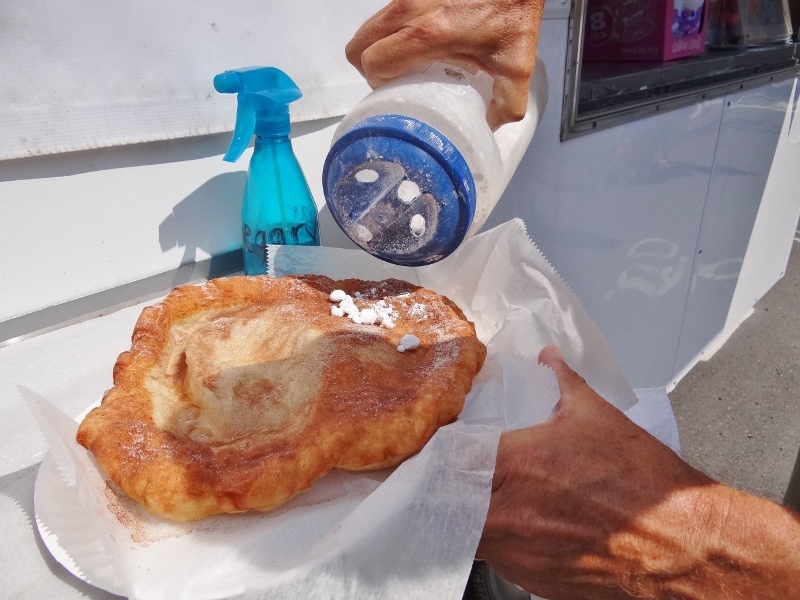 Lunch was a huge, delicious hunk of fresh fried dough that we liberally doused with cinn/sugar and some powdered sugar for the full experience. Once a year entitles us to this treat; it was excellent as promised. You may be familiar with Gorton’s; frozen seafood found in your favorite market. In 1849, John Pew & Son’s seafood business was founded and has since evolved into the nationally recognized Gorton’s of Gloucester, still located in the heart of downtown along the inner harbor. 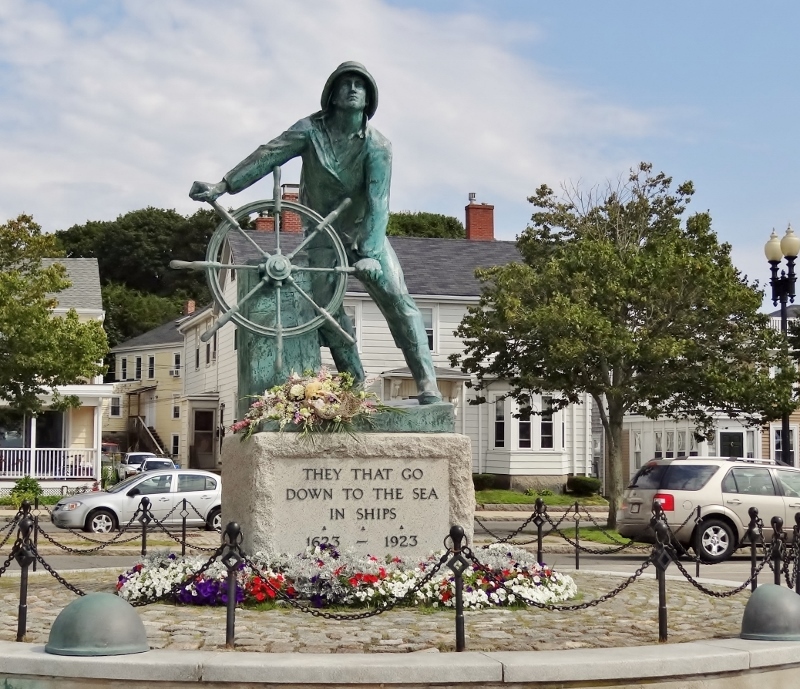 Their logo bears an extremely close resemblance to the Fishermen’s Memorial, the bronze statue of “The Man at the Wheel”. 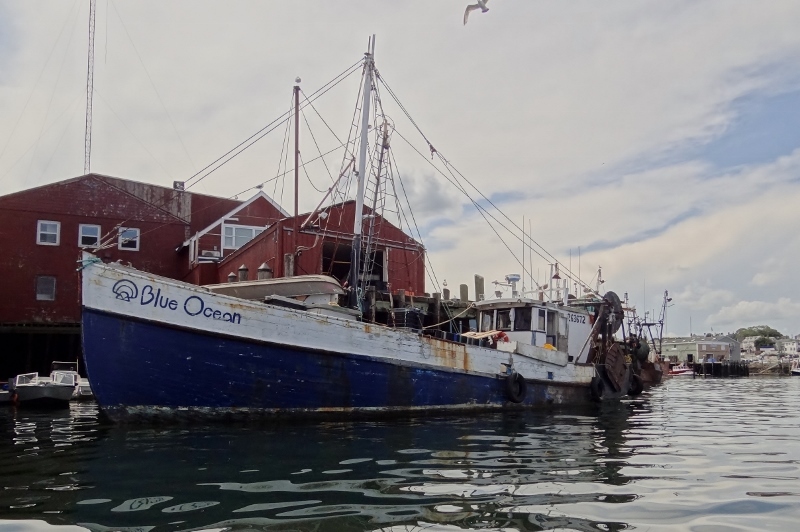 Our land travels took us along the beach side, into downtown and up through side streets finally coming across a Shaw’s on Railroad Ave.
A dinghy tour of the inner harbor brought us to many a fishing vessel, including f/v Blue Ocean. Leaving Boston the other morning we heard the Coast Guard’s side of a request for assistance from a boat taking on water. The urgency was clear and the CG wasted no time in deploying a boat with pumps. No, “how many persons on board?”, no “any children on board?”, no “are you wearing life jackets?”, just got the info and into action they went. So that led me to conclude that the vessel had to be a commercial fishing boat; they rule the waters up here. Sure enough there she was, not exactly queen of the fleet, but floating nevertheless. 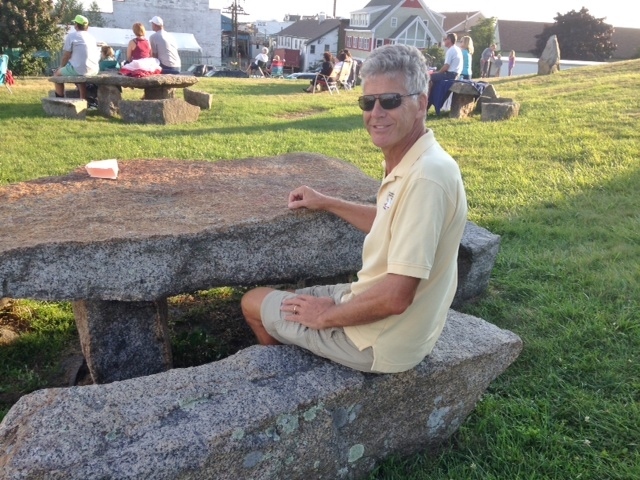 Late afternoon thunderstorms passed close by (Russ was hoping for a direct hit, crazy guy), stopping in time so we could go in to listen to Hot Tub Piranhas leading off the summer Friday night music event at the Fitz Henry Lane house on Harbor Loop. The musicians set up on a small round “stage” marked by a green buoy while attendees sit on the hill for a great view. 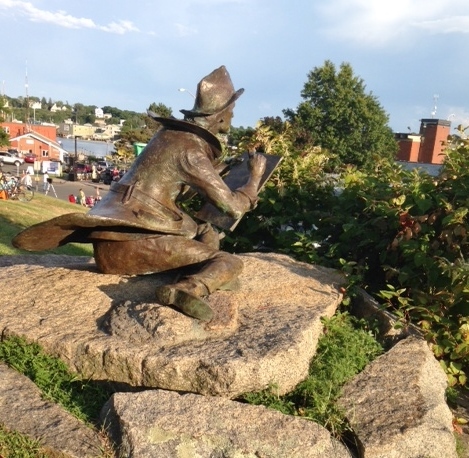 Fitz Henry Lane was an artist whose sculpted likeness graces the hilltop, sketching intently forevermore. Lane invites visitors to step into his shoes, perhaps to absorb a bit of his muse. 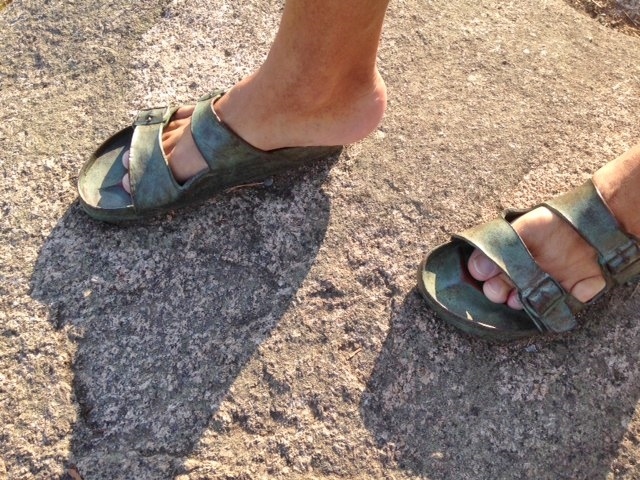 We did, Russ’s feet nearly becoming stuck- forevermore is right. I guess I didn’t stay long enough; no muse is my news.